Google's CEO Larry Page spent some time discussing issues near and dear to our hearts during the conference call with investors after the quarterly results came out yesterday. On the shenanigans with the Nexus 4: “clearly there’s work to be done managing our supply better, and that is priority to our teams.” Last week LG's France office boss said Google based their demand forecasts on previous Nexus phones sales, underestimating how much people would want the phone, and now LG has to up production to equate supply and demand by mid-February. As far as Motorola goes, so far things have been focused on restructuring and streamlining the phone maker's operations, but it is increasingly clear that in the end Google won't just keep it completely autonomous as it tried to portray during the purchase process. A few tidbits said by Larry Page and the CFO reveal that Google is much more involved in the strategy of the company than it was previously thought. Battery life is a huge issue. You shouldn't have to worry about constantly recharging your phone. When you drop your phone, it shouldn't go splat. Everything should be a ton faster and easier. There’s real potential to invent new and better experiences. Given that the rumors about a joint Google-Motorola X device are increasingly often, we might see the first attempt to bridge the gap from where we are now to where we want our phones to be in terms of durability and battery endurance as soon as Google's I/O in May. Motorola is top dog when it comes to battery life with its MAXX line, and Sony showed what can be done in terms of design and durability with the Xperia Z, so we are keeping hopes high. On the rivalry with Apple, Larry Page said that Google is taking the steady approach, perfecting products over long periods of time until nobody else can replicate them easily, and he gave the case in point saying "long-term investment in Maps has paid off," considering they've been working on mapping the world for a decade now, and Apple mustn't have spent more than a couple of years on its own software. Motorola gained a great opportunity with their MAXX'ed phones... If they can develop huge capacity batteries with smaller directions... they can put everything they want on their phones... , the yesterday mobile tech wars were Screens technology and Designs, Today they're fighting for Screen sizes and Processors, and the mobile tech war of tomorrow maybe is going to be Battery Duration?? 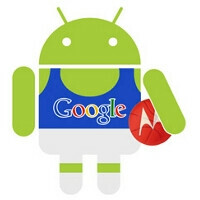 Motorola already has one step forward... they must not miss this chance. .. and the same edge-to-edge screen design (but this time with on-screen buttons of course). Yeah a top-spec flagship Defy would be great! And it was a brick. The Red Circle with the M in the middle will once again be a "very" popular brand. This means all the fault is of LG management. They underestimated the capabilities of their own engineers & workforce.. Well done great team effort LG..!!!!! They thought who would buy LG phones. So lets produce less phones.. LOL Google's only fault was that they chose & trusted LG.. I think they should stick to Samsung and HTC for their Nexus devices. It's like you didn't even read the article... LG isn't responsible for telling the customer how many phones they will buy. Google paid LG to be able to produce 1,000 phones per week when they really needed 10,000 phones per week. Now, Google must pay LG to be able to produce another 9,000 phones per week. Google and Motorola are focusing on the very most important things for phones now being that displays and processors have gone above and beyond what is truly needed for a Smartphone.